Beautiful, well-shaped understory shrub, usually 6-12’ tall, and multi-stemmed; found in moderately moist, fertile soil in deciduous forests; provides early-season nectar for Lepidoptera (like the overwintering mourning cloak butterfly); found only in southernmost Maine, though fairly common from Ontario to Michigan, south to Florida and Texas. The winter’s mildness and paltry snow have been unsettling to some, though a relief to others who live in Maine but don’t seem to enjoy the weather that ought to characterize this corner of New England. Some consequences of a warm winter are immediate: unsafe ice on lakes and ponds; messy, difficult conditions for loggers; an early, abbreviated maple syrup season. Mainers whose businesses depend upon a “real” winter have suffered, though municipal budgets haven’t had to stretch for extra snow removal, and there is the mixed blessing of few snow-related school closings. Long-term environmental impacts of anomalous weather are more complicated to measure with two possible exceptions. Warm, dry winters habitually create springtime ground and surface water deficits (and high springtime fire danger); and there is the expectation that insects and pathogens, normally thwarted by low winter temperatures, will rebound and spread. Maine’s hemlocks, Tsuga canadensis, can only resist the devastating advance of hemlock woolly adelgids, Adelges tsugae, with sustained low temperatures (-4 to -5 degrees Fahrenheit) that kill the active, overwintering generation of adult insects. 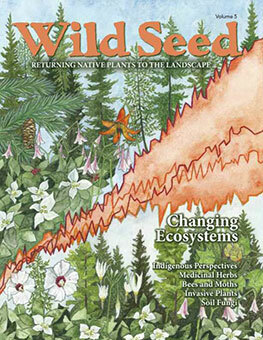 How do native plants respond to a snowless winter with record-setting warmth? A casual answer is that plants are seasonally resilient, especially those that don’t occupy specialized habitats. Plants with unusual habitat requirements can be precipitantly vulnerable. For instance, many alpine and subalpine plants will not survive the desiccation of winter gales without snow cover. Some herbaceous riparian plant communities depend upon periodic scouring ice to limit shrubby competition (Furbish’s lousewort, Pedicularis furbishiae, an endemic of limited habitat along the shores of the St. John River, is one of the plants that benefits from river ice). Freakish weather disrupts. If very warm late winter – early Spring temperatures coax buds to bloom prematurely, a hard frost (seasonally normal or expected) may be fatal. Seed and fruit production will be lost for the year, and birds and mammals will suffer as they search for food to prepare for migration, hibernation, or winter subsistence. When anomalous weather becomes the norm, the pattern is an altered climate. Some scientists believe that smaller faunal associates, the invertebrates, can keep pace with the changing phenologies of their host plants, but the science is young and the variables, complex. 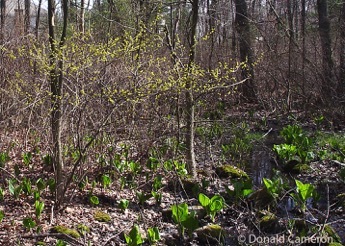 One species in Maine that might be scrutinized in the context of a changing climate is the northern spicebush, Lindera benzoin, which is at the tip of its northern range and found in only a dozen towns in York and Cumberland Counties, in the southern part of the State. If you are fortunate enough to know Lindera benzoin where it naturally lives, you may be able to observe whether or not the northern spicebush population expands farther north or west into other counties in Maine. What you may also see are the larvae (caterpillars) and adults of the spicebush’s exotic looking associate, the spicebush swallowtail butterfly, Papilio troilus. And while gardeners in more northerly parts of Maine may plant Lindera benzoin, finding it both garden-worthy and hardy, it is only in southern Maine that the spicebush and spicebush swallowtail coincide- unless increasing warmth impels a northward tandem migration for both species. Lindera benzoin is a lovely understory shrub of graceful habit, with an embrace of soft yellow-green flowers within its dark olive branches in mid to late Spring. The color of its small sunburst blossoms is much more compatible with the pastel hues of the Spring bulbs with which most gardens inaugurate the season. Forsythia, the traditional choice for Spring-blooming shrub has a yellow ferocity that only harmonizes with the color green. 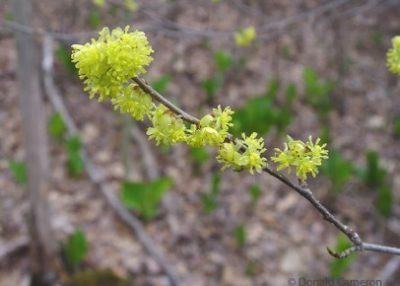 And yet Forsythia is planted by rote for its bumptious earliness when northern spicebush could be used much more felicitously. The overall shape of the Lindera benzoin is often described as “rounded in habit”, a mystifying portrayal. Instead, its multiple branches extend upward and outward, with fluid grace, in the lightly shaded understory that is its habitat. Ever as a specimen shrub, standing alone in sun or part-shade, one can’t imagine any form other than an openhearted vase shape unless the spicebush has been ill-pruned and tortured into an unnatural geometry as Forsythias often are. The color of Lindera benzoin’s bark is difficult to describe: somewhere between grey-brown and olive green, but so heavily mottled with silvery lenticels that the precise color is elusive. The bark is mostly smooth, except for the small lenticels; and the branches and twigs are alternating, “in wild elegance” according to a 1717 catalogue of trees and shrubs suitable for the English climate. Northern spicebush was introduced to British gardens in 1683, by a Virginian named John Bannister (1654-1692). Before settling in colonial Virginia, Bannister had studied at Magdalene College, Oxford, and knew some American plants from the University’s Physic Garden. (Bannister was the first university-educated naturalist in North America; his monograph on the elegant stinkhorn, Mutinus elegans, was the first published study of a North American fungus.) Bannister supplied seeds of what he and the Bartrams called the Benjamin bush to London gardeners. The colloquial name Benjamin bush is a corruption of Lindera benzoin’s species name. The genus Lindera was chosen by Carl Pehr Thunberg (1743-1828), a student of Linnaeus, to honor another Swedish botanist and physician Jonathan Linder (1676-1723). There are 80-100 Linderas in North America and East Asia. The etymology of “benzoin” could be said to meander along the routes of the spice trade, back into Europe from North Africa and from Asia. The spicy-smelling bark and leaves of Lindera benzoin reminded early plantsmen of the fragrances of gum arabic, frankincense, and of the taste of allspice. The different plants from different continents converged in the Arabic word for aromatic gum, “lo-benjay”, which became benjuf or benjuy in Spanish, benjoim in Portuguese, and benzoi in Italian. The Swedes added a Latinizing “n”. The American epithet “Benjamin bush” establishes the spicebush firmly in the New World in spite of the rich global history of its species name; but it doesn’t completely dispel the exoticism of spicebush’s fragrance. There is still a whiff, a reminder of the importance of flavorings and aromatics, crucial for preserving food, counteracting spoilage, and disinfecting the fetid odors of early colonial life. Northern spicebush has no other common names, usually a sign of a limited role in the early pharmacopeia. And yet its application is almost alphabetical: abortifacient, analgesic, candacide, carminative, depurative, diaphoretic, emetic, emmenagogue, febrifuge, panacea, stimulant, tonic, and vermifuge. When John Bannister sent Lindera benzoin seeds to England, there was difficulty getting the plants to bear fruit. The flowers of northern spicebush are dioecious which means that there are male (staminate) and female (pistillate) flowers. The pollinators for the flowers are small flies and early, solitary bees that were perhaps not abundant across the Atlantic. The flowers bloom in late April before the leaves appear; they line the branches in pointillistic clusters, but the overall effect is gauzy and delicate. The shrubs should be planted in small groups, not singly, so that their flower display can be appreciated by pollinators and gardeners. Northern spicebush’s simple dark green shiny leaves turn clear yellow in autumn, a stunning scrim for the shrub’s glistening red fruit. Mourning cloak butterflies and spring azure butterflies both sip nectar from the northern spicebush’s flowers. The beautiful spicebush swallowtail butterfly lays its eggs on Lindera benzoin and its caterpillar is a serio-comic sight to behold. In its larval stage, the first three instars (the larval stage between molts is called an instar) look like very fresh bird droppings. The ultimate caterpillar is large and green, and according to David L. Wagner’s Caterpillars of Eastern North America, “the best snake mimic in North America”. The spicebush swallowtail’s caterpillar has a pair of huge snake-eye markings that are startling to birds. Other than the discreet nibblings of caterpillars, northern spicebush has few predators; the chemistry of its leaves and twigs and bark deters mammalian browsing. Twenty-four species of birds eat its fruit, whose fat content is about 35%. Thrushes, veeries, Eastern kingbirds, great crested flycatchers, white-eyed vireos, catbirds, American robins, and white-throated sparrows are among the diners, along with mice, chipmunks, squirrels, and raccoons. The intestines of all these birds and mammals are ideal “courier bags” for the seeds of Lindera benzoin, perhaps working in tandem with Maine’s changing climate to spread the northern spicebush deeper into the State. Spicebush is easy to grow from seed, if you have access to the fresh seeds from plants with female flowers. The fruits are an oval red drupe with a single seed inside. As the fruits ripen in late summer they will change color from green/yellow to orange/red. 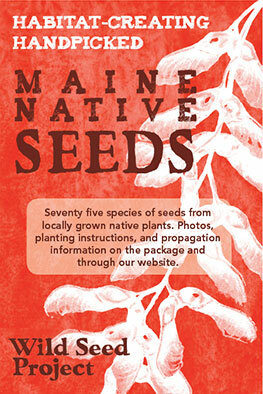 Birds relish the seeds, and if you want some for propagation collect them as soon as they turn red. Squeeze the seed out from the fruit, and sow immediately outside in a pot or seed bed. Germination will occur the following spring. N.B. Peter J Marchand’s Nature Guide to the Northern Forest contains a succinct description of plant, bird, and animal re-colonization in New England’s warming climate. 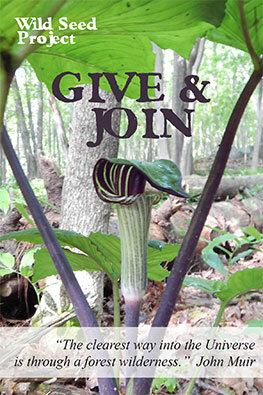 The New England Wild Flower Society’s 2015 State of the Plants details what changes have been documented and what can be expected for our flora.